For some, it can be a pain to transfer music between a phone and computer. Droid Transfer aims to make this process quick and easy for you. Not only can you transfer your Android music to your computer, you can transfer music from computer to Android, and even from iTunes to Android. Hit the "Music" tab from the feature list. Click "Add Music" or drag and drop music from your computer into Droid Transfer. Transferring music from your computer to your Android phone is easy with Droid Transfer. Once you have set up Droid Transfer on your PC, and connected your phone, click the "Music" tab in the features list. This will display all your music stored on your Android device. 1. Click the "Add Music" button in the Droid Transfer toolbar, then choose to either Add Folder or Add Files. You'll then be prompted to tell Droid Transfer what music you want to add to your phone. Once you have made your selection, click "OK" to confirm. 2. Drag music from your computer to Droid Transfer. 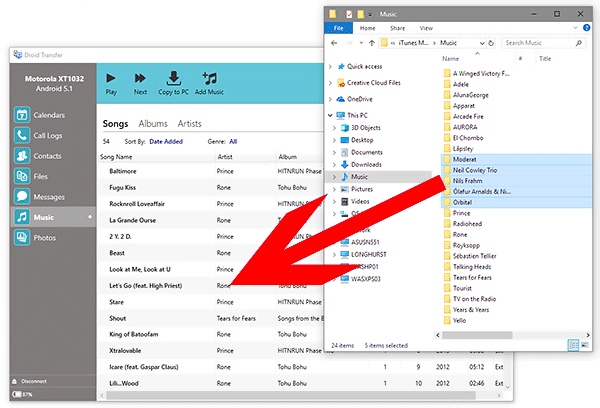 Open File Explorer on your PC and locate your music files. Select the music you would like to copy to your phone, then click and drag the files into the Droid Transfer window. So that's how to transfer music from computer to Android. Read on about syncing music between Android and iTunes.